You have heard of Germany’s Autobahn but how much do you really know about it? You may have the impression that it is some sort of “wild-west” of the open road, where speed limits don’t exist and finely engineered German cars speed along at incredibly dangerous speeds. You may think it is a singular stretch of highway. Well, get ready to learn more about the German Autobahn, and get ready to share this with your friends. How Different is this Highway? 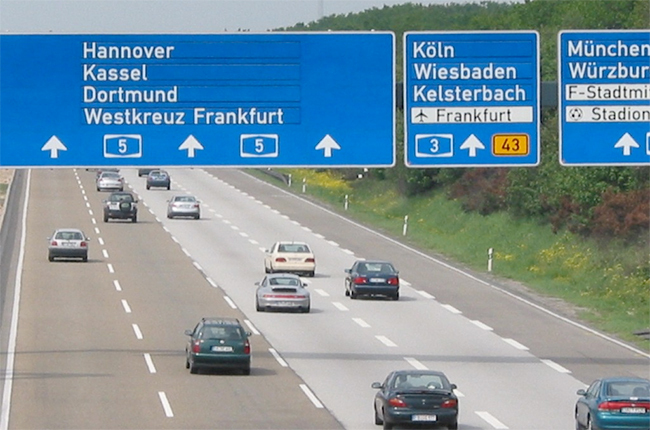 The Autobahn is not a stretch of highway but is actually the name of the German Federal Highway System. Much like the U.S. Interstate Highway System, it is a limited access network of roadways that vehicles can travel at higher speeds to get from one destination to another. It is generally two lanes separated by a safety berm. Far from a single stretch of roadway, the Autobahn is 7,982 miles of modern highway. In spite of Germany’s relatively small geographical size, the Autobahn is the fourth largest network of highways in the world. It follows only China, The United States, and Spain in total miles. So what about that “no-speed limit” reputation? Well that is only partially correct.There are speed limits on the Autobahn in congested areas near cities and during inclement weather. There are also stretches in some open areas the speed limit will be 81 miles per hours based on the history of accidents. There are however, stretches of the roadway where there is indeed, no speed limit. German regulations however, mandate that a vehicle is always under control, leaving room for the “reasonable speed” limits that are enforced in other nations. In all, about one-half of the miles of the Autobahn have a posted speed limit. Another factor plays a role in speed on the Autobahn. That factor is based on sort of a “handshake agreement” between the nations’ automakers that autos will be produced with a maximum speed that is about 155 mph. There are top range models available in the country that can reach speeds of 190 mph or more, if you are willing to pay enough. I forgot, does the U.S. have a no-speed limit highway? If you think defensive driving skills are important in the United States, where the absolute maximum speed is along a stretch of Texas highway at 85 miles per hour, imagine the skills needed to negotiate traffic approaching at 150 mph or more!